If you try this at home, don't blame us. 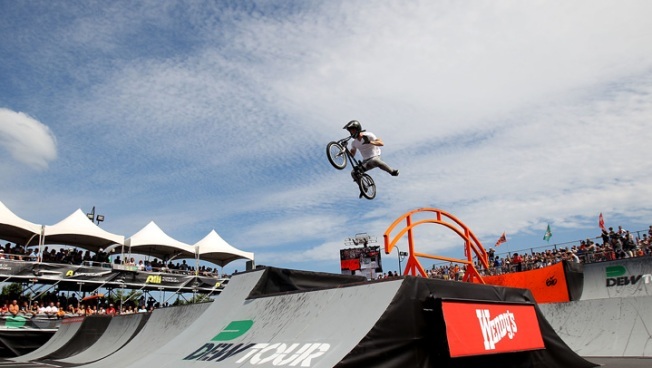 It’s our version of the X Games -- the 2011 Dew Tour is headed to Ocean City this Thursday, July 21. The tour kicks off its first of four stops Thursday at 11 a.m. with its Festival Village Open. If you're able to blow off work, head out for live music, video gaming, BMX and skate interactive courses, giveaways, new product demos and athlete autograph ops. Skate events will consist of four categories: Skate Park and Vert, BMX Park, Vert and Dirt, and for the first time, the Dew Tour will feature Skate Bowl. The tour will crown a champion in each of the categories, giving away a total of $2.5 million over the course of the year, and awards the Dew Cup to the champion at the season’s end. Maryland’s own Bucky Lasek will compete in this year’s competition.